Legislative tools to regulate the AI-based sharing of healthcare data and personal information are still missing. Many new initiatives are ongoing to create new IT infrastructures able to acquire personal data while leaving control to individuals that conferred them, and possibly compensating the possibility to use data for research purposes. A survey by KPMG shows that UK's citizens would be more prone to confer data to the National Health Services than to other organisations. Artificial intelligence (AI) is booming, and there is no day without a new application being announced also in healthcare. Recent examples see the use of blockchain technologies for the acquisition of consent or to collect, store and manage genomic data of wide populations to run R&D activities. On the other hand, the legislative framework regulating this potentially disrupting innovation is still far to accommodate issues related to the acquisition of data and the possibility for third parties to access them for secondary use. 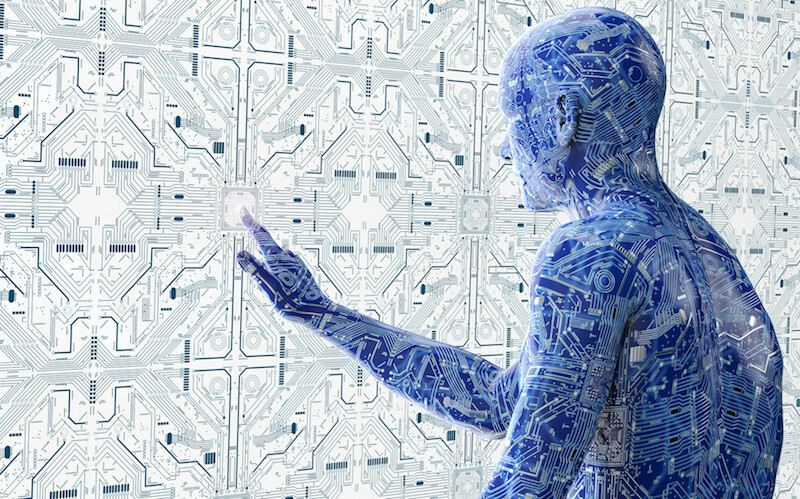 The perception of this approach among the general public is still widely anchored to a more traditional vision, according to a survey run in the UK by KPMG; some observers also highlight the hidden dangers of a possible decline of democracy in favour of mass control using AI-based applications…the Big Brother might turn to become real, tells The Medical Futurist, highlighting how autocracies might misuse the power of data and digital transformation. 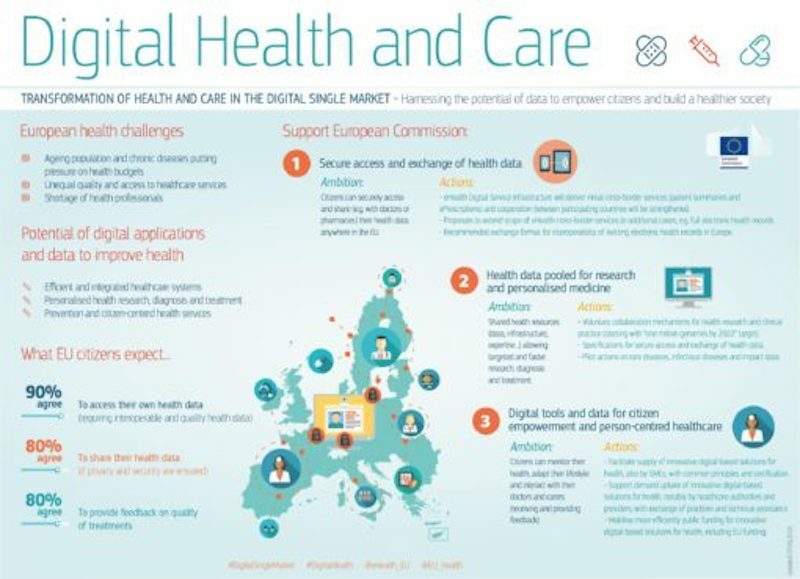 The European Economic and Social Committee (EESC) adopted on 17 September 2018 a positive opinion on the EU Commission’s Communication ‘Transformation of Health and Care in the Digital Single Market, empowering citizens and building a healthier society’. According to the EESC, the impact of the digital transformation will significantly change the intrinsic nature of medical work, as well as that of other healthcare professionals. Machine- and deep-learning algorithms in the next future will represent a fundamental player of the decisional process for diagnosis and treatment, supporting doctors on the base of the great amount of knowledge accumulated through the analysis of big data. This new digital approach is expected to allow doctors to dedicate more time to their patients, suggests the EESC, and patients will remain in any case at the centre of every new healthcare policy. Of course, a big effort to educate and train healthcare professionals to acquire the new skills linked to AI is paramount. The European Economic and Social Committee also highlights the need to completely rethink the organisation of healthcare systems in order to accommodate the potentialities offered by digital technologies. Interoperability across the eHealth European network is particularly important from this point of view, especially in view of a closer cross-border cooperation as indicated by EU’s Directive 2011/24/EU. According to EESC’s opinion, care is due to become a long-term personal service expected to supporting the increasing impact of ageing and related chronic diseases. A critical issue of the digital transformation relates to the fair access and control of each individual’s personal data and with whom their are shared. A “right to (free) copying” is the suggestion advanced by the Committee, representing an active form of protection of data that users generate while interacting with healthcare digital platforms. The original data conferred through the platforms should be considered as an original product created by the user, and thus protected according to the intellectual property legislation, says the EESC. Data mining is another issue that would require the adoption of new ethical, legal and social framework, according to the opinion. Actions to rebalance the current socioeconomic asymmetry typical of data driven economies would also be needed; this might be pursued working to the development of safe platforms and providing support to not-profit, cooperative organisations to manage the storing, management and sharing of copies of the acquired personal data. The EESC’s opinion also refers to data from the European Commission telling that around 90% of European citizens would agree with the possibility to digitally access their health data. 80% of the EU’s population would also agree to share their data, provided a guarantee of privacy and security, and it would be available to provide feedback on the quality of this sort of instruments. In the UK, the estimated perception of the digital healthcare transformation among the wide public appears by now to be much lower, according to KPMG’s analysis “How the UK can win the AI race”, drafting the roadmap for the country’s post-Brexit policies to 2030 for the implementation of artificial intelligence. Around a third (32%) of the 2,000 British citizens included in the survey thinks to already posses the digital skills needed to use AI technologies, while for another 61% there is need to acquire new competences and skills. Confidence on the potential impact of AI to improve the performance of the National Health Service (NHS) falls to just 53% of respondents, and 56% is available to provide its own data to the NHS in order to achieve this goal. Not so much, but in any case far better than the trust in other types of organisations potentially interested in the collection of personal health data, such as for example the pharmaceutical industry (15%), charities (11%) or internet and communication companies (8% each). It is significant to note that around a quarter of the sample (24%) would not confer its personal data to any kind of organisation, including the government, the police or banks. According to KPMG, the amount of health data stored by the NHS should be considered as a national asset, able to open the door to an AI healthcare industry able to conquer the global leadership. Trust is one of the main barriers that still need to be shot down, and privacy represents an issue for 51% of respondents. Just 31% of the sample thinks AI might contribute to better informed decisions, able to decrease the errors intrinsic to human decisions. Data protection and sharing it’s not a worry just for common people, and many new initiatives are emerging trying to develop an improved framework to provide consent and control access to each individual’s personal data. “I’ve always believed the web is for everyone. That’s why I and others fight fiercely to protect it. The changes we’ve managed to bring have created a better and more connected world. But for all the good we’ve achieved, the web has evolved into an engine of inequity and division; swayed by powerful forces that use it for their own agendas. Today, I believe we’ve reached a critical tipping point, and that powerful change for the better is possible – and necessary”, writes the inventor of the world wide web, Sir Tim Berners-Lee, in a letter presenting his new project Solid (“Social linked data”). The open-source project aims to change “the current model where users have to hand over personal data to digital giants in exchange for perceived value”. Berners-Lee’s new platform should represent, in the mind of its inventor, the natural evolution of the web able to provide the possibility to keep control over any kind of digitally shared data, while neutralising data silos and incompatibility issues. According to its website, the project shall focus on the proposal of a set of conventions and tools for building decentralised social applications based on “linked data” principles. One of these is the principle of “personal empowerment through data”, that shall become fundamental according to Tim Berners-Lee. The Solid project would provide users with a choice about where their data are stored, and who may access select elements. Authorised apps might also share the conferred data, providing a completely new experience for the user and opening to “multiple market possibilities, including Solid apps and Solid data storage”, writes Tim Berners-Lee. The development of the Solid platform infrastructure is managed by the startup company inrupt, founded by him together with John Bruce, previously founder and CEO of Resilient. Sir Tim Berners-Lee is not the only one working to decentralise consent, access and control of personal data. Hu-manity.co, for example, is a US company using blockchain to allow people to manage their “31st human right”, the property of their personal data. The mission itself of the company is focused on “developing human rights and corollary sovereign laws in a decentralised manner on blockchains”. Something that sounds at least ambiguous, if we considered the private nature of the company, compared to the official 30 human rights that were established in 1948 by an intergovernmental institution, the United Nations. Empowered communities are in this case too at the centre of action as, according to hu-manity.co’s vision, they should represent the driven force for the next generation of human rights and policies emerging from a balance of centralised power and decentralised technologically empowered communities. To achieve this challenging goal, the company is flanked by the Hu-manity.science research foundation, those activities are more focused on the convergence of social policy and technological innovation to catalyse socioeconomic impact. The creation of a global inherent Human Data Consent and Authorization Blockchain is the core business of Hu-manity.co; a blockchain that might be accessed by interested individuals through the dedicated app “#My31”, developed in collaboration with IBM and launched at the beginning of September 2018. The company expects the app to become a reference point to confer personal data, especially the healthcare ones, provide consent for their usage and control on their sharing. Options to provide compensation for users who agree to share their data with, for example, pharmaceutical companies are also planned to become operative in future. Traditional and new players are starting to implement projects that might revolutionise the way new medicines are discovered and R&D activities are run. GSK, for example, signed last July a multi-year collaboration with 23andMe, a consumer genetics company providing genetic profiling services to over 5 million people. GSK has also made a $ 300 million equity investment in 23andMe, and the two companies said they will share 50% the costs of the agreed research programmes. 23andMe genomic and phenotypic information is expected to prove useful to generate new insights for the identification of novel drug targets under the personalised medicine approach, tackle new subsets of disease and enable rapid progression of clinical programmes. According to the companies, 23andMe customers will be able to choose if to contribute their information (in an aggregate and de-identified form) to a unique and dynamic database for research purposes; more than 80% of 23and Me customers would have already voluntary consented to use their data, said the company. The resulting genetic and phenotypic resource would allow to better identify patient subgroups more likely to respond to targeted treatments and a more efficient enrolment for clinical trials. GSK’s first programme to enter this development platform should be LRRK2 inhibitor, which is currently in preclinical development as a potential treatment for Parkinson’s disease, said the multinational. In Indian State Andhra Pradesh, Shivom has started its pilot blockchain-backed programme targeted to use genomic data for diagnosis and treatment of type 2 diabetes. The company will collect, sequence and analyse DNA of thousands of patients as well as control healthy people, working in collaboration with Genetic Technologies Limited. Collected genomic data will be extracted, analysed and secured on Shivom’s blockchain-based genomics datahub, to be then anonymised and analysed to develop a diagnostic SNP panel specific to the Indian population. According to the company, patients maintain control of their data, and can withdraw it from the database when they want. Anonymised data might be easily shared and interoperable across technological boundaries, adds the company, and patients might be initially compensated with health insights and benefits, while in a compensation option for data use in trials is planned for the future.